Shazam and Freddy witnessing something alarming. 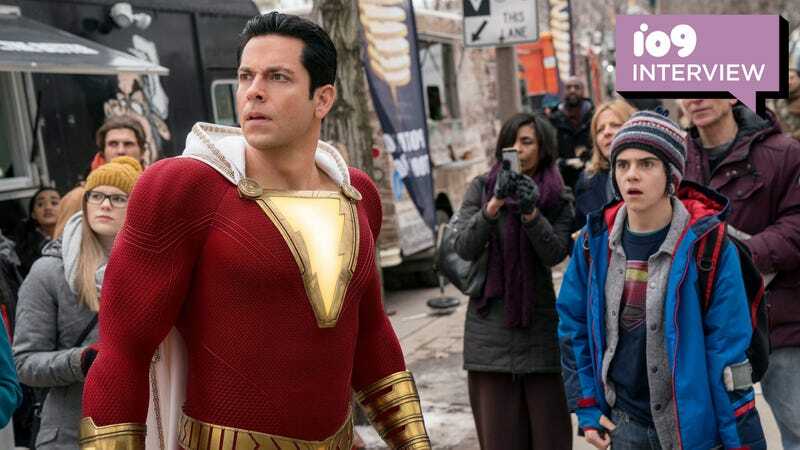 When we recently talked with Shazam director David F. Sandberg and producer Peter Safran about the film, they explained that making the film fun was of the utmost priority. Now that it’s in theaters, we can delve into a bit more into what that means. Sandberg’s Shazam is the kind of movie that takes you by surprise. As much as it’s a product of the currently superhero-saturated cinematic landscape, it’s also a surprising shock to the system in terms of it feeling novel, fresh, and a decidedly un-grimdark take on a golden age comics hero—a first for the DCEU. While fun was important, the filmmakers also wanted to use Shazam’s conceit—a kid magically transforming into an adult—to tell a more complicated story about what it really means to be a hero and how adults can end up hurting children in significant ways that they don’t understand. Shazam’s a kids’ movie, they insisted, but it’s also so much more. io9: In terms of theme and tone, what were the things you really wanted to define Shazam? David F. Sandberg: This is really a movie about family. Finding that group of people who are going to be there for you and who you can trust. That’s something that Billy’s never had in his life, but I also wanted to get into how everyone finds their family in different ways, and you can see that in each of the kids, but also in Sivana himself. Peter Safran: We also really wanted to make a movie that felt like a movie about the kids in this world who use social media and superheroes are kind of like celebrities for them. It’s about wish fulfillment, but it’s also grounded because for Billy and Freddy, superheroes aren’t these entirely impossible beings. io9: Does old Shazam feel any responsibility for creating the monster that Sivana becomes? Sandberg: His bedside manner definitely needs some work, but he was running out of time and really, really needed to find his champion. If he thought about it, I think he might feel some responsibility, but at that moment, his mission was more important to him, and Sivana ends up being hurt. io9: Billy and Freddy live [in a world] where superheroes are a known quantity. In your mind, how does knowing that heroes like Superman and Batman exist influence his approach to heroism? Sandberg: Right, so superheroes are real and a part of Billy and Freddy’s world. They’re the people these kids look up to, especially Freddy, and Shazam is everything that Billy believes superheroes are, even though he doesn’t admit it early on. io9: Let’s talk about Sivana’s villainy. There’s a moment when Sivana attacks his father, brother, and their board members with the seven deadly sins and I was shocked at how objectively horrific it was. How do you go about adding that perfect amount of horror into a movie that’s otherwise so bright and fun? Safran: It’s important to me to have stakes in a movie like this, and Billy has to feel them. You can’t have a villain who’s supposed to be scary and yet you never really see them do anything to justify that fear. Sandberg: There’s no blood in that scene you’re talking about, but we wanted people to know that those people’s lives are in danger and Sivana’s capable and willing to kill them. That’s who Billy’s up against, and after that scene, there’s no question in your mind who Sivana is. He’s not just bad, he’s dangerous, and the danger he’s putting people in is very real. io9: In your mind, where does Shazam, as a character, fit into the larger DCEU? Sandberg: By the end of the movie, you see he’s got the attention of other heroes. Shazam’s on Superman’s radar. Even though he still loves Philadelphia, I don’t think he’d only ever want to protect that one city. Our goal this time around was to make the best movie we could and that meant focusing on Billy here, but who knows what’s in his future? io9: The third act definitely features a lot of CGI but it doesn’t feel claustrophobic or jarring to look at. How’d you go about crafting that final battle to keep it from feeling too CGI heavy? Sandberg: The biggest thing for me was to take advantage of being able to shoot in the city as much as possible. It’s a group of people flying around fighting each other, so you have to make sure that the setting feels like a real place. A lot of what you’re seeing when you’re looking at Shazam flying, that’s Zachary up in the air on wires because I wanted to make you feel where he physically was in the scene as much as possible, and it’s hard to get that just on a stage. io9: Was there ever any question that you were going to introduce the entire Shazam family? Sandberg: We always knew that we wanted to see the whole family together in the costumes, and it’s why we spend so much time getting to know all of them. They’re not just Billy’s team, they’re his family. They’re the people he wants to be with and the best way to bring all of that together was to get the whole Shazam family together for the first time. io9: Was that...Mister Mind? When did you decide to include him, and why? Sandberg: Yes! He’s this weird, super powerful character with all of this might wrapped up in a tiny little package and he felt like he belonged in the movie. He doesn’t get much to do, but he’s got plans for the future. Shazam is in theaters now. Could There Be Even More Villains in Shazam?